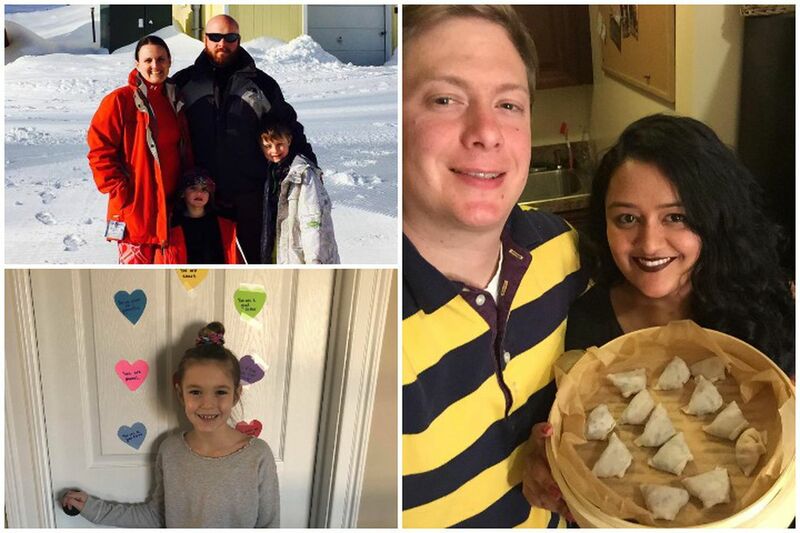 (Top left): Jonathan and Sarah Waple, ages 37 and 36, with their children Jackson, 8, and Hayden, 6, at Mad River Glen in Vermont on Valentine's Day in 2017 (Bottom left) Avery Longo, 9, stands in front of her bedroom door decorated with paper hearts from her parents. (Right) Couple Simon Reinhardt, 31, and Meghana Sharma, 31, show off their homemade dumplings. The Valentine’s Day dinner tradition for Teresa Glass’ family is usually a night at Wegmans with the kids and a weekend fondue party with old neighbors. Meghana Sharma and her boyfriend are using the holiday as an excuse to head to Flushing, N.Y., over the weekend for their own dumpling crawl. Abbe Stern is throwing a “Galentine’s Day” self-care party for her girlfriends at the LUSH in Center City. None of these Philadelphia-area residents are planning the traditional Valentine’s Day, as shown by the love-themed advertisements that say fancy dinner, flowers, chocolate, and jewelry are the best ways to proclaim how much you love a significant other. Instead, they’re part of a growing number of people who may not say they are celebrating Valentine’s Day specifically but still plan to spend money in some fun way around the holiday. Spending this Valentine’s Day is expected to increase 6 percent to $20.7 billion this year, breaking the 2016 record of $19.7 billion, according to an annual survey by the National Retail Federation and Prosper Insights & Analytics. But the spending seems to be increasing in nontraditional Valentine’s Day traditions. While people still purchase the traditional roses, chocolate boxes, and jewelry, a quarter of people celebrating this year said they were looking to gift an experience to loved ones beyond a spouse or partner. “It’s easier and easier to acquire stuff, but people are also saying I don’t need just stuff anymore,” said Barbara Kahn, a marketing professor at the University of Pennsylvania’s Wharton School. " That’s all part of some general trend and it would make sense that you might see it in terms of Valentine’s Day." It’s smart of retailers to advertise to the array of people who may or may not have romantic plans on Valentine’s Day, Kahn added. The concept of sharing memories or experiences is a more “modern point of view” about people’s roles in relationships, whether that is a significant other or friend, and helps more broadly define what Valentine’s Day means to consumers. 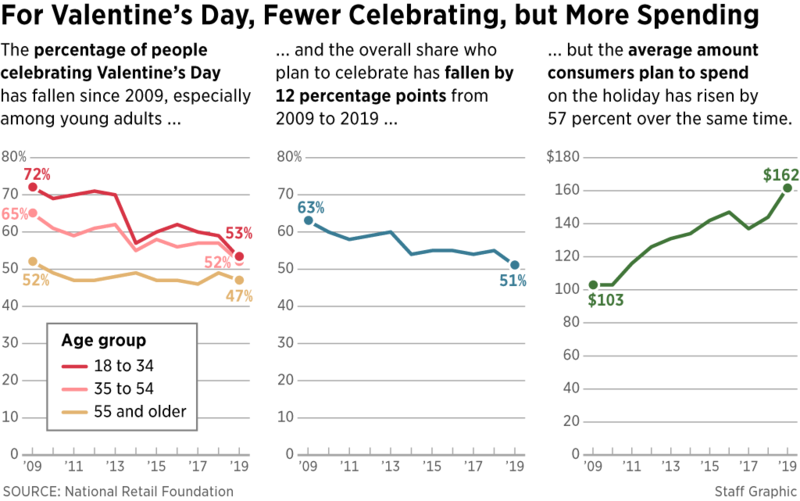 Though people are spending more for Valentine’s Day, the percent of people celebrating has dropped when compared with a decade ago, the survey found. 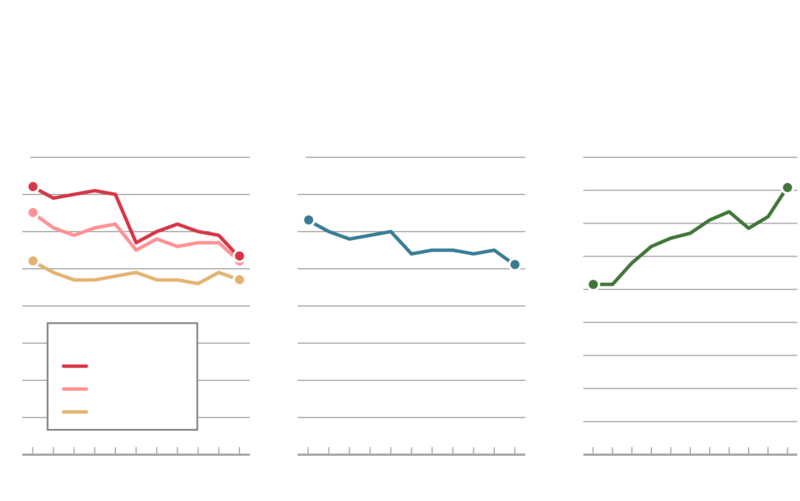 This year 53 percent of 18- to 34-year-olds planned to celebrate Valentine’s Day, down from 72 percent in 2009. 57 percent over the same time. Even while those under 35 told the NRF they are not celebrating this holiday, more than a third conceded they still plan to do something on Feb. 14, whether it’s hanging out with other single friends or treating themselves to “self-care.” This was true for half of the 18- to 24-year-olds who said they are not celebrating Valentine’s Day. Spending per person celebrating increased an average of $18.40, but only $4.26 of that increase came from spending on a significant other or spouse, the NRF found. The rest of the increase comes from gifts for other family members, friends, children’s classmates or teachers, coworkers, and pets. Sarah Waple, 36, of West Chester, and her husband don’t usually have the opportunity to do something for just the two of them on Valentine’s Day with hectic work schedules and two kids, an 8-year-old boy and 6-year-old girl. Still, they found a way to celebrate this week with a cupcake and beer pairing event Monday at Levante Brewing. And on actual Valentine’s Day, the family will be skiing at Mad River Glen in Vermont for the second year in a row. It isn’t because of Valentine’s Day that they are taking this vacation, Waple said. It just worked out that this is when the kids have half days or are off from school. Carolyn Longo’s Valentine’s Day tradition is focused on her kids instead of a romantic night alone with her husband or gift giving, she said. Every day this month, Longo, 42, of Media decorates her kids’ bedroom doors with a new construction-paper heart with a handwritten compliment or words of affirmation unique to them. Longo said she and her husband have been focused on nonmaterial ways to show her children they love them, instead of buying little chocolates or toys for the holiday. After a few years of this tradition, Longo said, her son, 9, and daughter, 8, now expect to find these hearts on their doors in February and look forward to it. On Feb. 14, she said, they are planning to just have a family dinner wherever the kids are in the mood to eat.